Diving can be a dangerous sport, and the USA's Steven LoBue was taught that lesson on Sunday. The athlete hit his head on the diving platform in front of 75,000 spectators, but managed to finish his routine like a champ – landing feet first as intended. 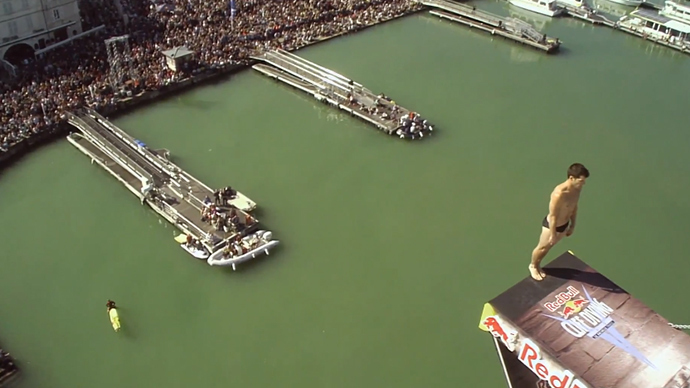 Footage from the Red Bull Cliff Diving World Series in La Rochelle, France, shows LoBue, 29, with a look of intense concentration as he focuses on his upcoming dive – a back triple somersault with four twists. Standing on the 27-meter-high platform – the size of an eight-story building – LoBue begins his dive as 75,000 people watch expectantly. At first, he appears to be off to a strong start, executing his routine as planned. But as he comes back around for the second twist, he hits his head on the end of the platform. Gasps are immediately heard from the crowd, but LoBue manages to recover, completing his dive beautifully. He even lands feet-first in a cat-like finish, as planned. The mistake, which took place during the third of four rounds, cost LoBue a place in the final – but the athlete was in good spirits when all was said and done, despite sporting a big gash on his forehead. “I think that one just got the best of me a little bit, but I made it down to the water safely, I finished the whole dive, so I'm happy about that. I've just kind of gotta shake it off and get ready for [my next competition] in Texas,” he told a film crew. Established in 2009, the annual World Series is the world's biggest cliff diving competition. It features both male and female top international divers, who take the plunge from a 27-meter-high platform – a significantly higher launching point than those used in Olympic diving competitions.